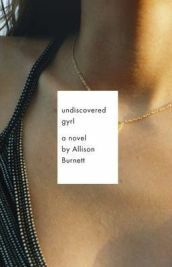 In his novel Undiscovered Gyrl author Allison Burnett gets into the head of a teenage girl and tells her story through her anonymous blog, which is at turns humorous, touching and frighteningly real. Authors have always been told “write what you know”, but as far as I can tell, this is a rule that Mr. Burnett has shunned totally. Had it resulted in an unsuccessful novel, would have been understandable. But amazingly, it doesn’t. How a 50-something male author can get so much into the head of a teenage girl is totally beyond me. And as far as I know, he hasn’t got any teen-aged daughters to draw upon either.